With the blessing of His Grace Bishop Irinej, 20 members of St. George Serbian Orthodox Church in North Canton, Ohio, embarked on their 5th annual Lenten retreat to New York. 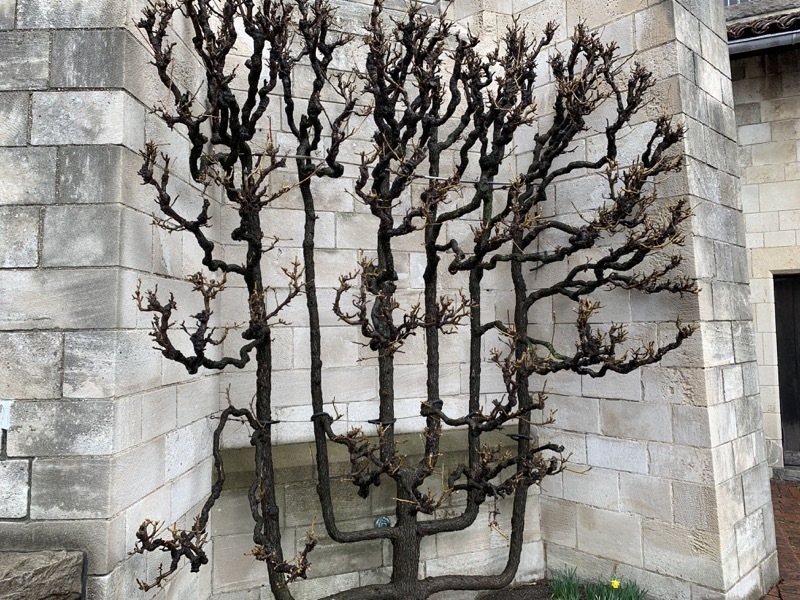 The program began began on Friday, March 22nd, when the faithful group gathered at the Cloisters Museum in New York City. This museum is a branch of the Metropolitan Museum of Art and houses art and architecture of medieval Europe. Woven into the fabric of the building are a number of elements from medieval monasteries that, together, house over 2000 works of art. 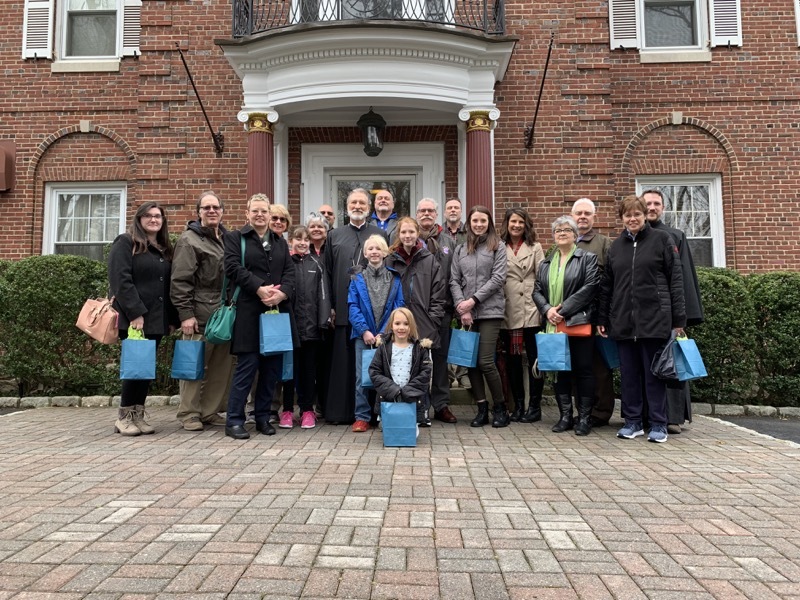 Immediately following their visit to the Cloisters, the attendees departed for New Rochelle, New York, to seek the blessing of their diocesan bishop, His Grace Irinej. The group arrived shortly after the lunch hour and received a personal tour of the Diocesan Center from their beloved hierarch. The group marveled at the beauty of the historical elements and artwork preserved for display. His Grace Bishop Irinej, together with the diocesan staff, showed the faithful of North Canton great hospitality, joining them for conversation over coffee and Lenten snacks in one of the diocesan meeting rooms. 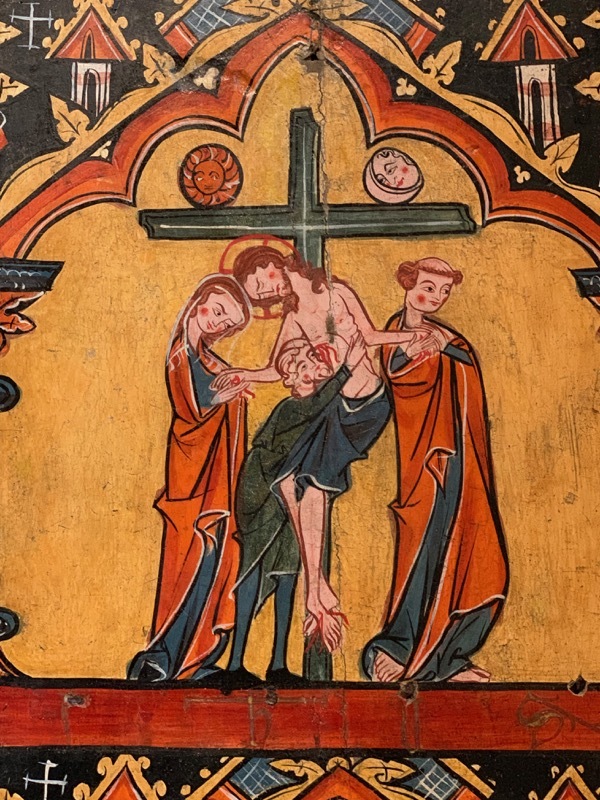 As a final show of love and appreciation, His Grace offered each member of the group a parting gift, as well as His blessing. The day finished with a visit to St. Vladimir’s Seminary in Crestwood, New York, where the group met with Mat. Robyn Hatrack, the Events, Hospitality, and Alumni Officer. 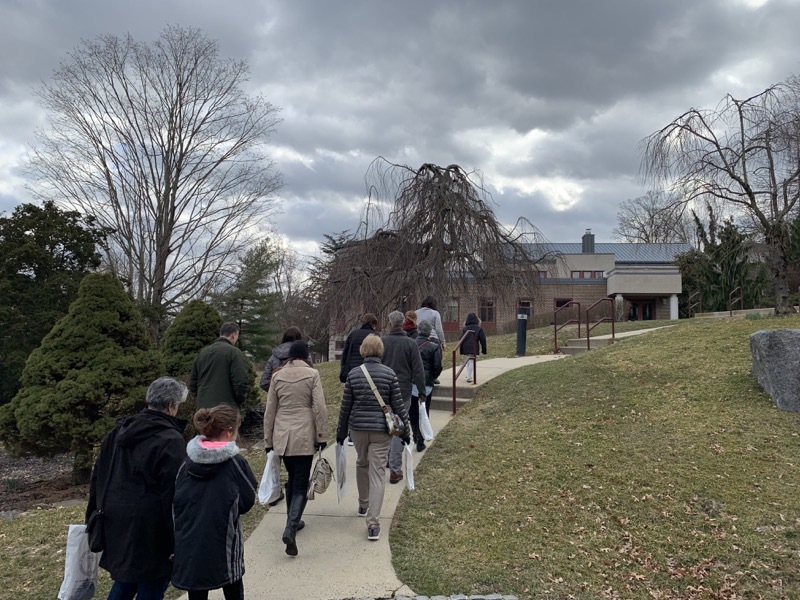 She took the group on a tour of the seminary grounds, including a visit to the bookstore for SVS Press. The tour concluded in the Three Hierarchs Chapel where the faithful enjoyed a Lenten reflection by Fr. Chad Hatfield, Seminary President. Fr. 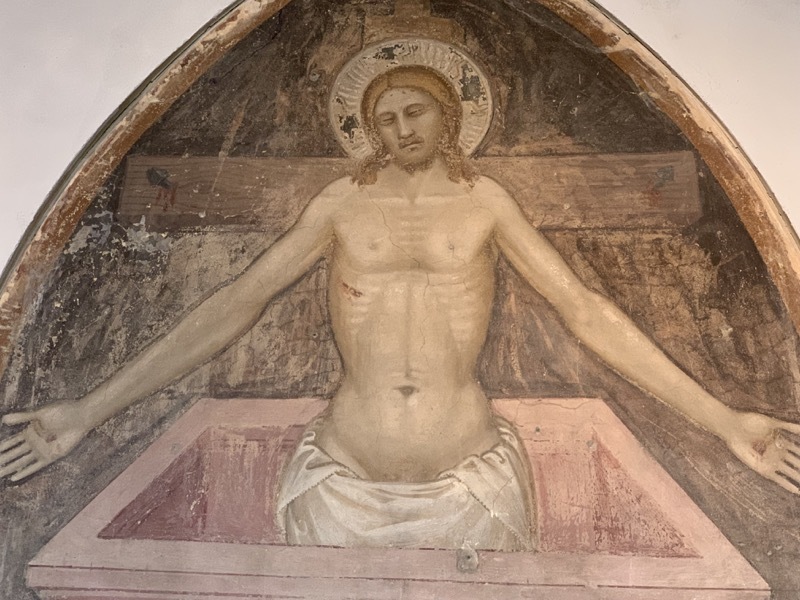 Chad reflected on how historical Christianity has always been counter-cultural, with Christians confessing their faith in ways that their contemporaries did not expect or understand. 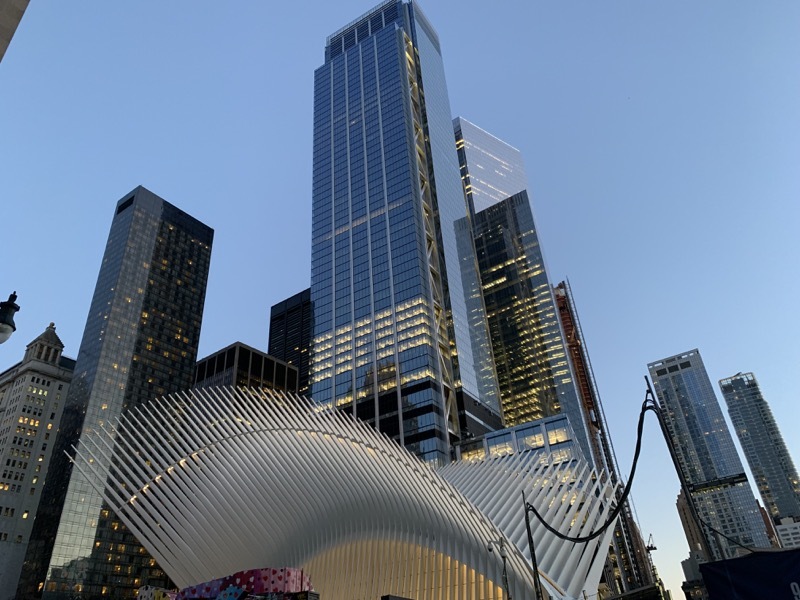 Given the trajectory of modern culture, Fr. Chad exhorted the faithful to be prepared for the challenges of living an Orthodox Christian life in the 21st century. 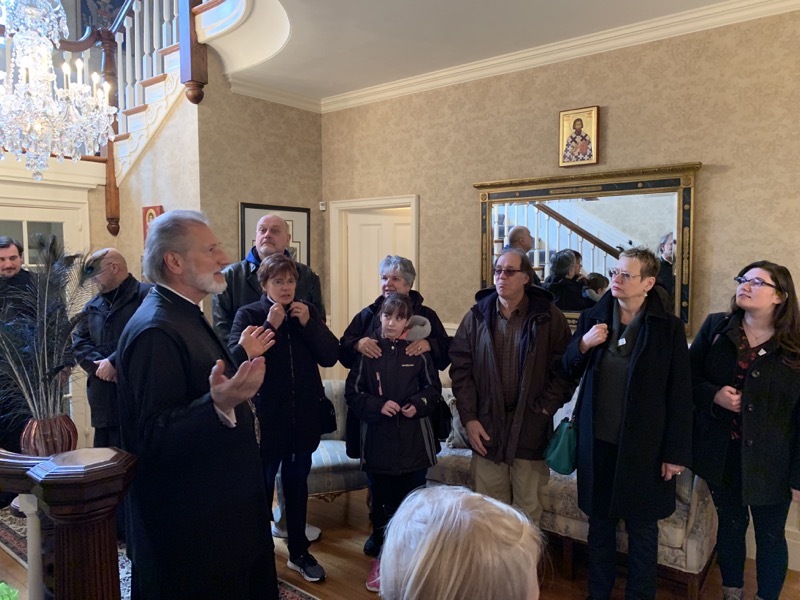 The retreat concluded with Divine Liturgy on Sunday, March 24th, with faithful from St. George in North Canton joining the faithful of the St. Sava Pro-Cathedral community at St. Eleftherios Greek Orthodox Church in Manhattan. This year, as an additional blessing, the Serbian Orthodox faithful concelebrated with their Greek brethren for Divine Liturgy. Hymns alternated seamlessly between the magnificent St. Sava Choir and traditional Byzantine chanters. Following the service, a memorial prayer was offered by His Grace Bishop Irinej for the innocent victims of the NATO aggression and bombing of Serbia on the 20th anniversary of that tragic event. His Grace thanked the loving community at St. Eleftherios for supporting the Serbian faithful of New York during their reconstruction. He offered that faithful Greek Christians had long offered support and care to their Serbian brethren, including, but certainly not limited to, a show of support during the NATO aggression in 1999. In addition to sending professionals, doctors, and aid workers, Greece collected many tons of humanitarian food and medicines for those Serbian people suffering from the NATO bombing. After the luncheon, His Grace invited everyone to join in the singing of “Memory Eternal” in Serbian for all of those who innocently perished at the hands of NATO aggression. 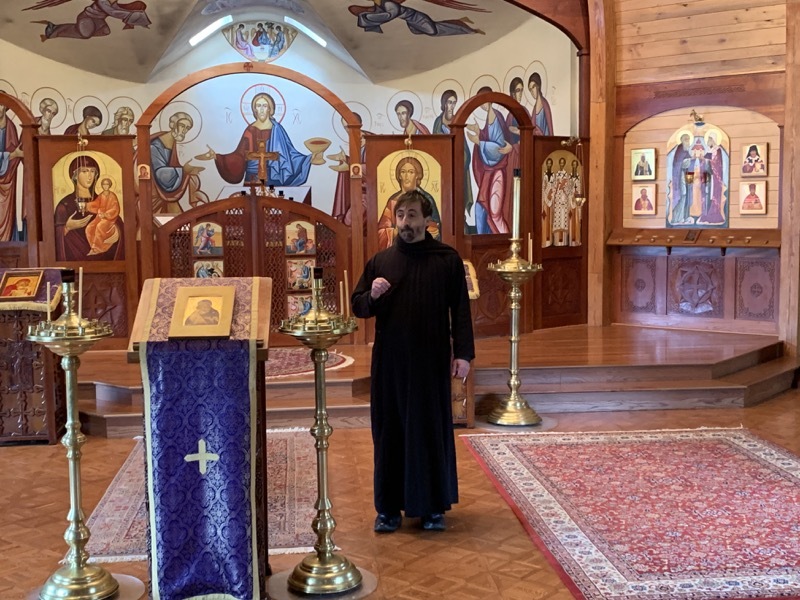 During the Lenten meal that followed, His Grace also offered His blessings to the St. Eleftherios community on the Prefeast of Annunciation, and the eve of Greek Independence Day. His Grace remarked on the accomplishment of the Greek people, fighting for their freedom after centuries of Ottoman oppression. The Greek faithful were moved by His thoughtfulness and kind words and joined him in singing in the Greek language the Kontakion to the Theotokos, “O Victorious Leader”, which is also sung, not only in honor of Greek Independence Day, but also, according to the Greek Tradition, every Sunday during Great and Holy Lent. 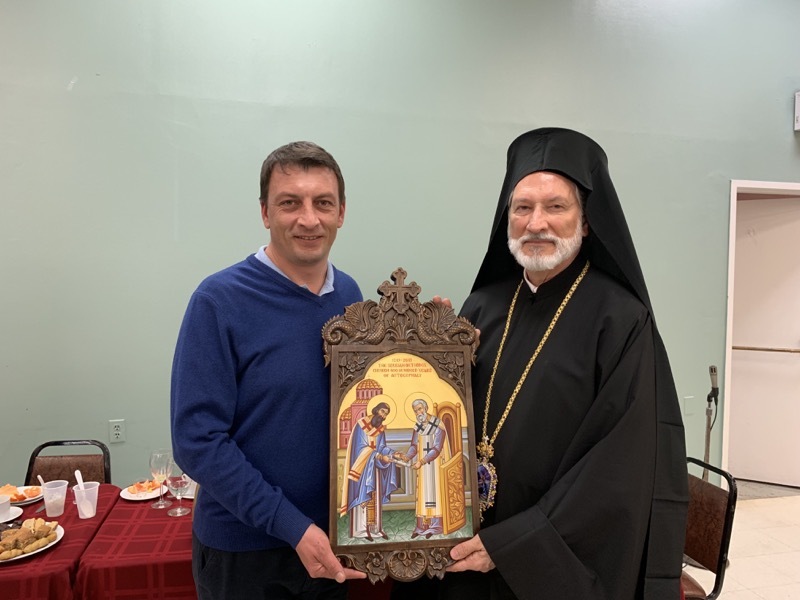 Near the end of the meal, His Grace received a gift from noted Byzantine iconographer Ognyan Denev, an icon of the Granting of the Tomos of Autocephaly to St. Sava by Patriarch Manuel I of Constantinople. This superlative and holy image was created to commemorate the 800th Anniversary of the Autocephalous Serbian Orthodox Church. 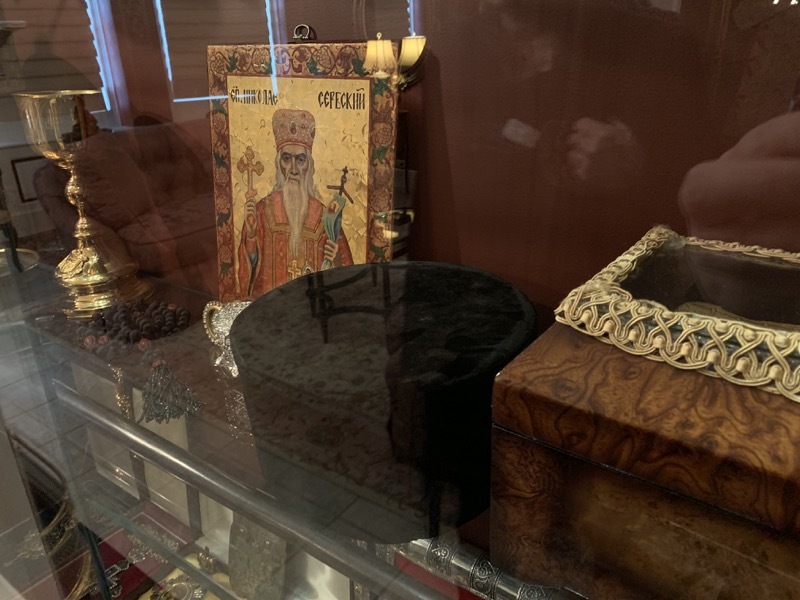 Many faithful parishioners from the communities of St. Sava, St. Eleftherios, and St. George, came forward to venerate the icon and behold its beauty before departing. 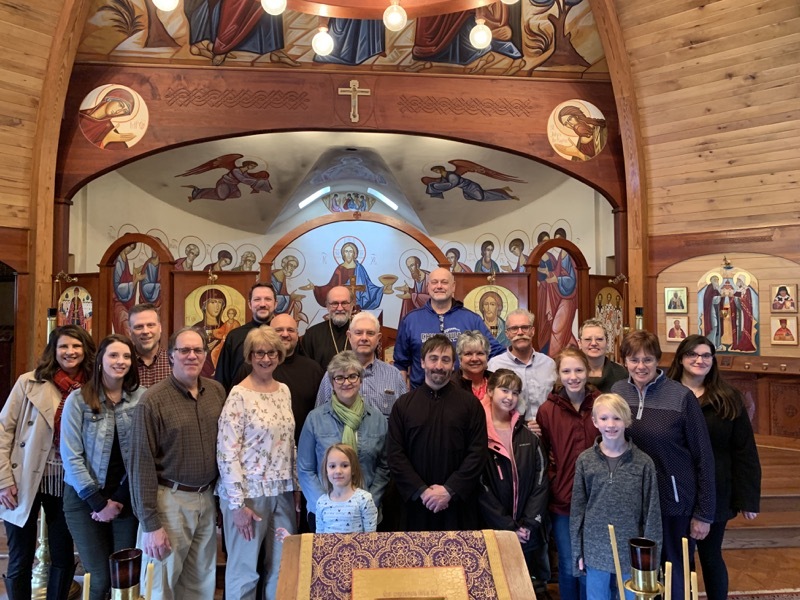 For the faithful parishioners of St. George Serbian Orthodox Church, this Lenten retreat, once again, helped strengthen their efforts during the Great Fast through prayer, worship, and education.